Sometimes I feel that the word "favorite" gets overused by wedding vendors. 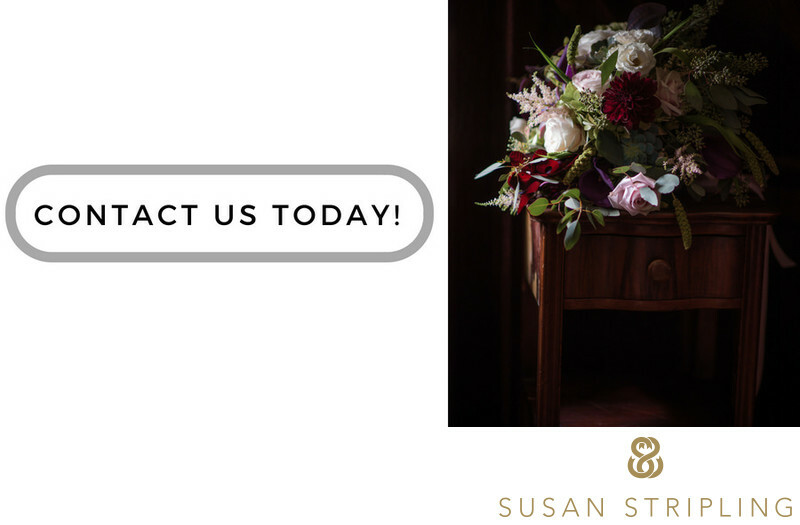 Every cake is my favorite, every wedding client is my favorite, every coordinator - they're my favorites, too! But some venues just DEMAND that you use that word, and Oheka Castle is one of them. Every so often I see something at a wedding that I’ve never seen before. 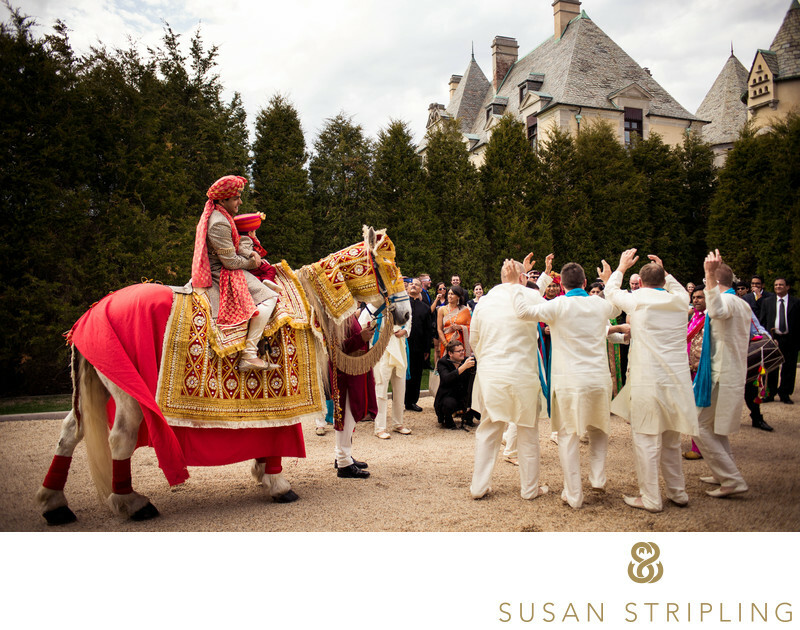 At this 2014 wedding at Oheka Castle I had the distinct pleasure of photographing my first baraat involving a horse. While this was not my first Indian wedding (not by a long shot) this was my first horse! I absolutely love photographing the baraat portion of Indian weddings. Oheka was a perfect location for this, with its’ long driveway and immaculate courtyard. For those not familiar with a baraat, it’s the procession of the bridegroom during an Indian wedding ceremony. The groom is surrounded by his family and friends, also known as the barati. They join the groom in the procession towards the bride’s family. 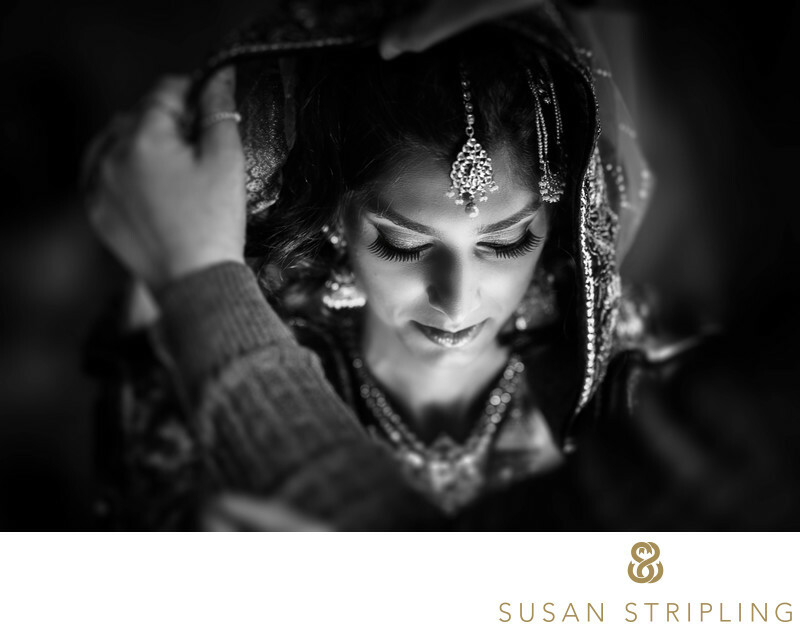 This image was taken at the start of the baraat, while the groom was waiting at the end of Oheka’s long driveway. The men dancing in the right hand side of the photograph are the groomsmen. Their mood was infectious and shortly the entire crowd was dancing and singing while the groom made his way up to the Oheka courtyard. The whole ceremony was so exuberant and joyous. I love the bright, vibrant colors of the groom’s attire and the dressing on the horse. I love seeing that juxtaposed against the start foliage of the background and the stark roof of Oheka in the background. This was my first baraat involving a horse and I surely hope that it won’t be the last! Oheka Castle truly is the ideal location for an Indian wedding. The outdoor spaces are enormous, accommodating even the largest of guest lists. The indoor ballroom is also large, and if it is not large enough, tenants can be erected outside on the lawn. It has been a joy to photograph Indian weddings at Oheka Castle over the past ten years! I look forward to the weddings I have commissioned at this venue this year, and the ones already commissioned for next year! Keywords: Huntington (183), Oheka Castle (225). 1/400; f/4.0; ISO 100; 28.0 mm.